Source: Trimec Industries Pty. Ltd. 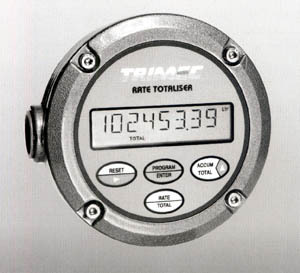 The RT100 flowrate totalizer is designed to operate with common pulse producing flowmeters such as positive displacement, turbine and paddle-wheel sensors, without the need for external power. External power is applied to interface with common controllers such as PLC's via the scaleable pulse output and/or optional analog output. Multipoint linearity correction of the flowmeter input is available to enhance accuracy and extend flow sensor rangeability. A cast aluminum enclosure complete with multiple conduit entries provides protection in industrial environments with the option of wall or pipe mounting via stainless steel brackets. Direct on meter and panel mounting versions are available. The totalizer is fully user programmable and has selectable PIN protection. Trimec Industries Pty. Ltd., P.O. Box 2444, 2/1 Koonya Circuit, Taren Point, ?? 2229. Tel: +61 (0) 2 9540 4433; Fax: +61 (0) 2 9525 9411.